Tatiana Gabriele Maslany (born September 22, 1985) is a Canadian actress. She is known for portraying multiple characters in the science fiction television series Orphan Black (2013–17), which aired on Space in Canada and BBC America in the United States. 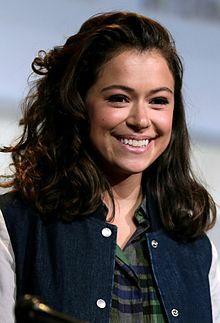 For her acting work in Orphan Black, Maslany won a Primetime Emmy Award (2016), a TCA Award (2013), two Critics' Choice Awards (2013 and 2014), and five Canadian Screen Awards (2014–18), in addition to receiving nominations for a Golden Globe Award and a Screen Actors Guild Award. Maslany is the first Canadian actor to win an Emmy in a major dramatic category for a Canadian series. She has also appeared in television series such as Heartland (2008–2010), The Nativity (2010), and Being Erica (2009–2011). In 2013, she won an ACTRA Award for her lead role in the film Picture Day and the Phillip Borsos Award for her performance in the film Cas and Dylan. Her other notable films include Diary of the Dead (2007), Eastern Promises (2007), The Vow (2012), Woman in Gold (2015), Stronger (2017), and Destroyer (2018). Maslany was born in Regina, Saskatchewan, the daughter of Dan, a woodworker, and Renate, a translator. She has two younger brothers, Daniel (an actor) and Michael. She has Austrian, German, Polish, Romanian, and Ukrainian ancestry. For elementary school, Maslany was in French immersion, and was taught in German by her mother before learning English. Additionally, her grandparents spoke German around her as a child. She also speaks some Spanish. She has danced since age four and started community theatre and musicals at the age of nine. Maslany attended Dr. Martin LeBoldus High School, where she participated in school productions and improvisation, and graduated in 2003. While attending high school, she found paying acting jobs that allowed her to travel all over Canada with her parents' approval. She would work for a few months at a time and then return to school in Regina. She stated, "It wasn't an easy transition. I felt a little outside of it. Outside of both experiences, really." After completing high school, she spent some time doing theatre performances and travelling before settling in Toronto, Ontario, at the age of 20. Maslany was one of the stars of the 2002 Canadian television series 2030 CE. She appeared as the character Ghost in the 2004 film Ginger Snaps 2: Unleashed. Maslany performed comedic improvisation for ten years. She participated in improvisational theatre, including the Canadian Improv Games, and has since become a member of the General Fools Improvisational Theatre. She is a certified improvisation trainer. In 2007, Maslany appeared in The Messengers as Lindsay Rollins. She also starred in the CBC series Heartland where she plays a barrel racer, Kit Bailey, with her horse Daisy. During 2008, she had a recurring role in the Instant Star TV series. She had a lead role in the Hallmark Channel film An Old Fashioned Thanksgiving. In September 2008, she portrayed Penny, a kidnapping victim in the Canadian series Flashpoint. Maslany appeared as Sarah Wexlar, the heroin-addicted daughter of Dr. Tom Wexlar in the second season of the Canadian comedy drama television series Being Erica in 2010. Also in 2010, she appeared as the protagonist Mary, the mother of Jesus, in the British four-part television series The Nativity, which was critically well received. Maslany appeared in Grown Up Movie Star as Ruby, a role which earned the actor a special jury breakout role award at the 2010 Sundance Film Festival. She played Hannah Simmons in one episode of The Listener. In 2010, she appeared in the direct-to-video film Hardwired as Punk Red. In late 2011, she co-starred in the film adaptation of John Sandford's Certain Prey as Clara Rinker, a contract killer. In 2012, Maslany appeared as lead character Claire in the full-length feature Picture Day, for which she won a Phillip Borsos Award for Best Performance at the 2012 Whistler Film Festival. Maslany plays half a dozen different clones over season one, with who knows how many more promised for the imminent second season ... Delivering one creditable performance for a show is tough enough, but Maslany nails several here, often appearing in scenes as multiple versions interacting seamlessly. This is Olympic-level, endurance acting. In 2013, Maslany guest starred on Parks and Recreation for a two-episode arc as Dr. Nadia Stasky. She portrayed the lead character Dylan in the independent film Cas and Dylan, for which she won a Phillip Borsos Award for Best Performance at the 2013 Whistler Film Festival. On June 11, 2013, Maslany signed with the US talent agency Resolution, which serves as her United States representation. In Canada, she continues to be managed by Magnolia Entertainment and represented by Characters Talent Agency. The 2013 Juno Award ceremonies were held in Regina, Maslany's home town, and Maslany was chosen as one of the presenters. On May 17, 2014, Maslany guest starred on the season 39 finale of Saturday Night Live. She played the character Bridget in the episode's second digital short entitled "Hugs". She guest starred alongside Pharrell Williams and The Lonely Island. Maslany co-starred in the 2015 film, Woman in Gold, in the World War II flashbacks as a younger version of Maria Altmann, Helen Mirren's character. She mostly spoke German in the film. Maslany starred in the independent film The Other Half. The film, written by Joey Klein, was produced by Motel Pictures with A71 and Sienna Films and co-stars partner Tom Cullen. It had its world premiere at South by Southwest on March 12, 2016. Maslany played the leading role of Lucy in the 2016 indie drama film Two Lovers and a Bear, starring alongside Dane DeHaan as Roman. The film follows the two characters as they come together in Apex, Iqaluit to find peace in their lives. Maslany starred in the 2017 film Stronger, as Erin Hurley, the love interest of Jeff Bauman, a victim of the Boston Marathon bombing; Bauman was played by Jake Gyllenhaal. Maslany was cast as a series regular in Ryan Murphy's 2018 drama series Pose, but was later replaced by Charlayne Woodard. She starred alongside Nicole Kidman in the crime thriller film Destroyer, which had its world premiere at the Telluride Film Festival in August 2018. Maslany has been dating Welsh actor Tom Cullen since 2011. The two met in Budapest while filming the miniseries World Without End. They reside in Los Angeles, California. Flashpoint Penny Episode: "Planets Aligned"
2009 The Listener Hannah Simmons Episode: "One Way or Another"
2010 Cra$h & Burn Lindsay Episode: "Closure"
Bloodletting & Miraculous Cures Janice Episode: "All Souls"
Alphas Tracy Beaumont Episode: "Anger Management"
2013 Cracked Haley Coturno / Isabel Ann Fergus Episode: "Spirited Away"
2015 BoJack Horseman Mia McKibbin (voice) Episode: "Let's Find Out"
2016 Robot Chicken Barbie (voice) Episode: "Hopefully Salt"
2018 Drunk History Emmeline Pankhurst Episode: "Civil Rights"
Animals. Sherman (voice) Episode: "Roachella"
2015–18 Comedy Bang! Bang! Herself 377: "Good Night In The Morning"
478: "Spank Me With A Feather!" 536: "Live from SXSW 2018"
2015 How Did This Get Made? Herself 120: "Masters of the Universe"
2017 Spontaneanation Herself 110: "The Manager's Office of a Miniature Golf Course"
^ "Tatiana Maslany". TV Guide. ^ Jimmy Kimmel Live (June 22, 2017). "Tatiana Maslany on Moving from Canada to LA". Retrieved September 26, 2017 – via YouTube. ^ "Tatiana Maslany and Tom Cullen stole cars and spelled their own names wrong". The A.V. Club. ^ "Canadian Tatiana Maslany wins Emmy for best lead actress in a drama". CTV News. Retrieved September 28, 2016. ^ a b Dedekker, Jeff (May 23, 2013). "Challenging role earns Maslany nomination". The Leader-Post. Regina, Saskatchewan. Archived from the original on January 13, 2014 – via Canada.com. ^ a b Lee, Luaine (January 7, 2014). "Eight expectations". The West Australian. Yahoo!7News. Archived from the original on August 26, 2014. ^ Taylor, Kate (March 27, 2013). "Meet Tatiana Maslany: a small-town Canadian 'salivating, starving for' her latest TV role". The Globe and Mail. ^ "Tatiana Maslany with parents and brothers". The Leader-Post. Regina, Saskatchewan. February 1, 2010. Archived from the original on January 13, 2014 – via Canada.com. ^ Chang, Kee (May 16, 2013). "Q&A with Tatiana Maslany". Anthem Magazine. Retrieved April 21, 2014. ^ a b c d Aurthur, Kate (June 21, 2013). "Why Patton Oswalt Thinks "Orphan Black's" Tatiana Maslany Is The "Best Actress Alive"". BuzzFeed. Archived from the original on April 30, 2014. ^ Sacks, Ethan (September 19, 2016). "Five things to know about Emmy winner Tatiana Maslany". New York Daily News. NYDailyNews.com. Retrieved September 20, 2016. ^ "Tatiana Maslany Chat with fan about Orphan Black and Evelyne Brochu". Retrieved June 12, 2014 – via Youtube. ^ "Q&A with 'Orphan Black' Star Tatiana Maslany". BBC America. April 8, 2013. Archived from the original on July 21, 2014. ^ Strachan, Alex (January 9, 2013). "Sci-fi series stars Regina actress Tatiana Maslany". The Leader-Post. Regina, Saskatchewan. Archived from the original on April 21, 2013. ^ Cupryn, Isabel (May 29, 2013). "Interview: Actress Tatiana Maslany talks 'Picture Day'". Criticize This!. Archived from the original on June 7, 2013. ^ Smith, Krista (March 29, 2013). "Orphan Black's Tatiana Maslany on Growing Up in Rural Canada and Playing an Intense Soccer Mom". Vanity Fair. ^ Maga, Carly (March 27, 2013). "Five things you should know about Canadian actress Tatiana Maslany". North Stars. Yahoo.ca. Retrieved June 3, 2013. ^ "Tatiana Maslany: 9 Things You Might Not Know About The 'Orphan Black' Star". Fashion & Style. Archived from the original on December 31, 2014. Retrieved December 31, 2014. ^ Chua, June (January 31, 2010). "Canadian actress celebrates Sundance win". CBC News. ^ Zlotnick, Tyler. "Orphan Black". BBC America Press. Retrieved January 13, 2013. ^ "Golden Globe eludes Regina's Tatiana Maslany". CBC News. Retrieved March 11, 2014. ^ a b "Emmy nominations 2016: See the full list". EW. July 14, 2016. Retrieved July 14, 2016. ^ Swift, Andy (September 18, 2016). "Orphan Black's Tatiana Maslany Wins First Emmy Award: 'I Feel So Lucky'". TVLine. Retrieved September 19, 2016. ^ a b Lincoln, Ross (November 14, 2016). "Critics' Choice TV Nominations Unveiled". Deadline Hollywood. Retrieved December 9, 2016. ^ "Tatiana Maslany is dazzlingly impressive to watch". ^ Vlessing, Etan (December 8, 2013). "Tatiana Maslany Repeats as Best Actor at Whistler Film Festival". The Hollywood Reporter. Retrieved December 9, 2013. ^ "Resolution Signs 'Orphan Black's Tatiana Maslany". Deadline Hollywood. Retrieved June 19, 2014. ^ "Regina's Tatiana Maslany, Anne Murray and others announced as presenters for Junos broadcast". The Leader-Post. Regina, Saskatchewan. April 17, 2013. Archived from the original on May 2, 2013. Presenters will include 24-time Juno Award winner Anne Murray, who will be inducting k.d. lang into the Canadian Music Hall of Fame, Blue Rodeo frontman Jim Cuddy, Canadian musician and co-founder of Broken Social Scene, Kevin Drew, as well as Regina native and star of Space's Orphan Black series, Tatiana Maslany. ^ "SNL's Andy Samberg Episode: 5 Best Scenes". The Atlantic. Retrieved May 18, 2014. ^ "Orphan Black's Tatiana Maslany joins Helen Mirren in Woman in Gold". DigitalSpy. Archived from the original on June 26, 2015. Retrieved May 18, 2014. ^ "Joey Klein Biography" (PDF). GoSharonGo.com. Retrieved December 31, 2014. ^ "The Other Half". MotelPictures.com. Archived from the original on April 2, 2015. Retrieved March 17, 2015. ^ "The Other Half". South by Southwest. Retrieved September 19, 2016. ^ "Tatiana Maslany, Dane DeHaan to Star in Indie Drama 'Two Lovers and a Bear' (Exclusive)". TheWrap. Retrieved January 31, 2015. ^ "Tatiana Maslany in talks to play one person in David Gordon Green's Stronger". The A.V. Club. Retrieved October 10, 2015. ^ Denise Petski (December 27, 2017). "Ryan Murphy's Dance Musical 'Pose' Gets Series Order At FX". Variety. Retrieved December 28, 2017. ^ Valentini, Valentina (March 18, 2016). "Tatiana Maslany and Boyfriend Tom Cullen on 'Joyful' Experience Working Together and Those 'Orphan Black' Spoilers". Entertainment Online. Retrieved July 27, 2016. ^ "Tatiana Maslany: 5 Fast Facts You Need to Know". Heavy.com. Retrieved June 19, 2014. ^ Murphy, Mary. "'Orphan Black' Star Undergoes Hollywood Treatment". New York Post. Retrieved September 16, 2014. ^ "Tatiana Maslany Says Goodbye to 'Orphan Black'". Marie Claire. August 13, 2017. Retrieved September 26, 2017. ^ Petski, Denise (April 12, 2019). "Tatiana Maslany To Star In HBO's 'Perry Mason' Limited Series From Team Downey". Deadline Hollywood. Retrieved April 13, 2019. ^ "Career Success". Regina Summer Stage. Archived from the original on November 2, 2014. Retrieved November 2, 2014. ^ "Tatiana Maslany works to keep 'Orphan' clones straight". USA Today. Retrieved November 2, 2014. ^ "The Secret Garden". Globe Theatre, Regina's Flickr Account. Retrieved November 2, 2014. ^ a b "George Dandin". Globe Theatre, Regina. Retrieved November 2, 2014. ^ "Off-Broadway Hit Dog Sees God to Make Toronto Premiere in 2009; Casting Announced". Playbill. Retrieved November 2, 2014. ^ "Other People". Tank House Theatre. Archived from the original on February 11, 2015. Retrieved November 2, 2014. ^ "Mary Page Marlowe". Lortel Archives. Retrieved March 13, 2018. ^ "Tatiana Maslany to Star in Network on Broadway; Production Switches Theaters". Broadway.com. Retrieved September 11, 2018. ^ "'Locke & Key' Is Coming Back — With Tatiana Maslany And An All-Star Cast [Exclusive]". MTV News. Retrieved October 10, 2015. ^ "'Tatiana Maslany to narrate special-edition Hunger Games audiobook: First listen". Entertainment Weekly. Retrieved October 31, 2018. ^ a b c d e f g "Awards Database – Person Name: Maslany [search]". Academy of Canadian Cinema & Television. Archived from the original on August 10, 2016. Retrieved June 16, 2016. ^ "World Cinema Special Jury Prize For Acting Winners". Sundance Institute. Retrieved June 12, 2016. ^ a b "Whistler Film Festival – 2002 to 2015 winners". Whistler Film Festival. Retrieved January 19, 2017. ^ "Winners Announced – 2013 ACTRA Awards in Toronto" (pdf). ACTRA Toronto. February 23, 2013. ^ "2013 winners". criticschoice.com. Retrieved January 19, 2017. ^ Moraes, Lisa de (August 4, 2013). "TCA Awards: 'House Of Cards' Snubbed As AMC's 'Breaking Bad,' FX's 'The Americans' Nab Top Honors – Winners List". Deadline Hollywood. Retrieved January 19, 2017. ^ "Young Hollywood Award Honorees: Lucy Hale, AnnaSophia Robb & More". Hollywood Life. July 17, 2013. Retrieved January 19, 2017. ^ "Picture Day". Clique Pictures. ^ "People's Choice Awards 2014: FULL LIST of Winners". People's Choice. January 9, 2014. Archived from the original on April 3, 2014. Retrieved January 19, 2017. ^ "Winners & Nominees 2014". www.goldenglobes.com. Retrieved January 19, 2017. ^ "2014 | Categories | International Press Academy". www.pressacademy.com. Retrieved January 19, 2017. ^ "Nominees 2014 Awards". ACTRA Toronto. Archived from the original on February 9, 2014. ^ "And the 2014 VFCC Nominees Are …". vancouverfilmcritics.com. December 23, 2013. Retrieved January 19, 2017. ^ "2014 Gracies Winners – Alliance for Women in Media". Alliance for Women in Media. Retrieved January 19, 2017. ^ "2014 winners". criticschoice.com. Retrieved January 19, 2017. ^ "The Television Critics Association Announces 2014 TCA Award Nominees As It Celebrates 30 Years Of The Prestigious Awards Program – Television Critics Association". tvcritics.org. Retrieved January 19, 2017. ^ a b "The Constellation Awards – A Canadian Award for Excellence in Film & Television Science Fiction". constellations.tcon.ca. Retrieved January 19, 2017. ^ "Best Actress, Drama – EWwy Awards 2014 – Meet Your Winners". Entertainment Weekly. ^ "SAG Awards Search | Screen Actors Guild Awards". www.sagawards.org. Retrieved January 19, 2017. ^ "2015 ACTRA Awards in Toronto – The Winners". ACTRA Toronto. Archived from the original on August 26, 2016. Retrieved June 13, 2016. ^ "Nominations Search". Television Academy. Retrieved January 19, 2017. ^ "The ACTRA Awards in Toronto | ACTRA Toronto". www.actratoronto.com. Retrieved January 19, 2017. ^ "THE INTERNATIONAL PRESS ACADEMY ANNOUNCES NOMINATIONS FOR THE 21th ANNUAL SATELLITE™ AWARDS" (PDF). Press Academy. November 28, 2016. Retrieved December 14, 2016. ^ "2017 TV Nominees – Academy.ca". Academy.ca. Retrieved January 19, 2017. ^ "2017 Film Nominees – Academy.ca". Academy.ca. Retrieved January 18, 2017. ^ "2017 ACTRA Awards in Toronto Nominees | ACTRA Toronto". www.actratoronto.com. Archived from the original on February 20, 2017. Retrieved February 19, 2017. ^ Tapley, Kristopher (December 6, 2017). "Netflix, FX's 'Feud' Lead Critics' Choice TV Nominations". Variety. Retrieved December 6, 2017. ^ "Guest Actor in a Drama Series – Emmys: Netflix Beats HBO With Most Nominations". The Hollywood Reporter. Retrieved July 12, 2018. Wikimedia Commons has media related to Tatiana Maslany. This page was last edited on 13 April 2019, at 04:02 (UTC).